Welcome to the True20 Wiki. is a generic role-playing game system designed by adventure roleplayers for adventure roleplayers. It's meant to be the most amount of fun with the least amount of work, offering flexibility and choice without bogging down in unnecessary detail or rules. It gives you the tools to have exciting adventures and then gets out of your way to let you do it. 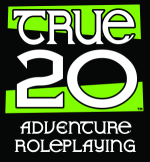 is a place to find all of the official and fan made settings and resources for the True20 system all collected and organized for easy reference. It's also a place to submit projects of your own creation and collaborate with others. All Open Game Content is contained within shaded boxes.